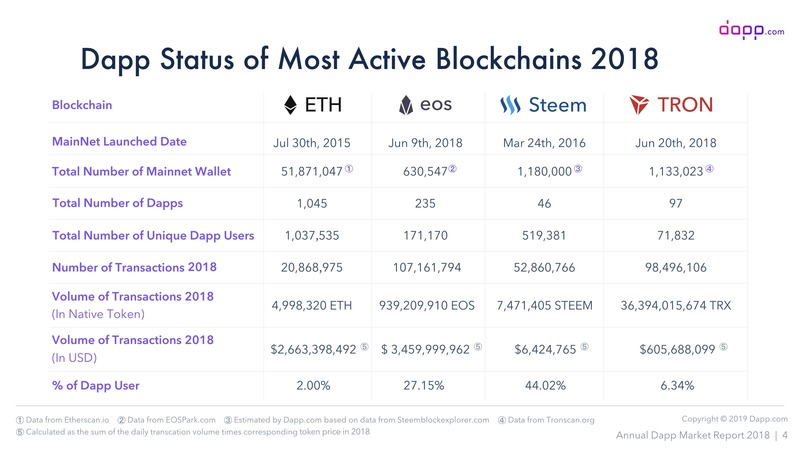 In 2018, Ethereum dapps has $2.6 Billion worth transaction volume in 2018; EOS has $3.45B; TRON has $600M. However, number of transactions on Ethereum is way less than EOS and TRON. Ethereum has a huge user base but TRON has a lot of incentives to offer and they have strong marketing support. Ethereum is a well-proven platform for standard DApps, most of ICO's and DAO's are successfully done in ETH. And the main net is launched 4 years back. If you want standard well proven and trusted consumer DApps, then better you can choose Eth. Trust of ETH is higher. And the community is very big you can get help quick. Issues might be gas price, need to learn a new language..,etc. Some of the cryptos are offering prizes for dApps. If you want to launch standard dApp better to choose well-proven protocols. Or if you want to validate your idea or lack of funds better to choose new tech and approach appropriate teams. I am not in favor of one protocol, it's up to your business logic. Currently, blockchain still evolution, in the worst situation you should have backup plans like migration, stop apps. dApps can fail anywhere like from your logic, mining, protocol issue, or 51% attack, or other way chain attacked. This is primarily opinion based, but considering how more and more blockchains are popped up, consider using some framework that allows you to switch between blockchains like cosmos or equivalent. Not the answer you're looking for? Browse other questions tagged transactions dapps scalability eos or ask your own question. What is BigchainDB and how can it be used with Ethereum? What are differences between Ethereum and EOS? Any coding games made for learning how to build out ethereum smart contracts?